“The current situation is precarious, with new arrivals coming every day to the UN Protection of Civilians camp in Bentiu in search of shelter and protection. 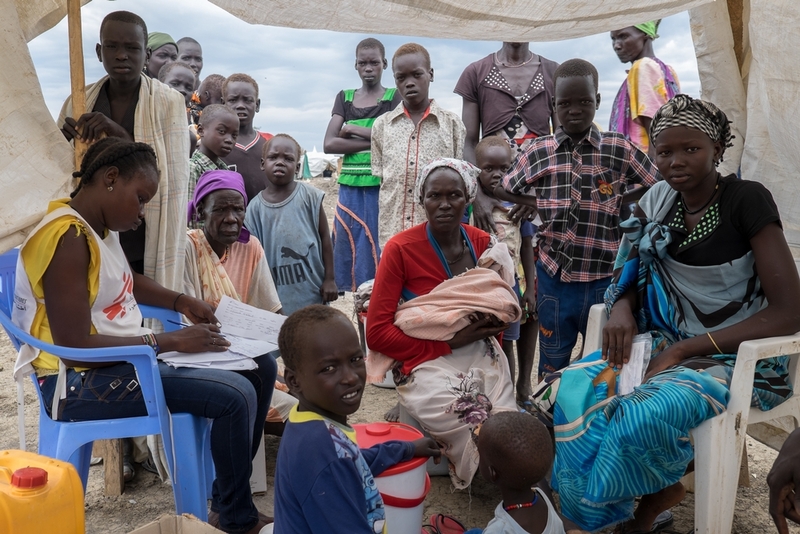 The upsurge of fighting in Unity state, South Sudan since April has forced many from their homes and an estimated 110,000 displaced people are now living here. That’s more than double the number of people here a few months ago and it feels more like a city than a camp. The extra influx of people has increased pressure on existing resources, including the hospital run by Médecins Sans Frontières/Doctors Without Borders (MSF) which is nearing full capacity. We’ve seen a significant increase in malaria cases over the past month, treating over 2,000 cases in July alone and admitting over 150 people to our facility with severe complicated malaria. In an attempt to reduce this, and to limit the complications of severe malaria, we’ve started supporting three emergency clinics in the camp for children under five years old that provide swift access to diagnostics and treatment. Severe malnutrition is equally concerning. In July alone, our hospital admitted more than 100 young children suffering from severe malnutrition with complications for intensive therapeutic treatment. Unfortunately many children arrived too late at the hospital with advanced symptoms resulting in a very high mortality (23% mortality reported in July). There is a real risk of an outbreak of hepatitis E virus. Although there have been sporadic cases of hepatitis E virus detected since October 2014, over the last six weeks there appears to have been a consistent and significant increase in people with jaundice (signs of liver inflammation) who have later tested positive for hepatitis E by rapid diagnostic testing. Currently MSF is seeing a high hospitalisation ratio (37.0%) and a high case fatality ratio (4.0%). Three pregnant/post-partum women have died in the last few weeks alone. Contaminated water, poor sanitation and hygiene provision are largely implicated in major outbreaks of hepatitis E. In light of the suspected outbreak, the hygiene conditions in Bentiu Protection of Civilians camp need to be urgently improved. This includes increasing hand washing facilities and supplemental soap distribution coupled with targeted hygiene messages to allow the people to reduce transmission risks for themselves and their families, and be vigilant to the signs and symptoms of hepatitis E infection. Dr Ruby Siddiqui is an epidemiologist supporting Médecins Sans Frontières field projects with medical surveillance, monitoring, and outbreak investigation. She’s currently in the UN Protection of Civilians camp in Bentiu, South Sudan where an estimated 110,000 people are sheltering from the conflict.